With 88 votes in favor and 54 against, Georgia's new Government, headed up by Prime Minister Georgian Dream Leader Bidzina Ivznishvili, was confirmed on October 25. After being sworn in, Ivanishvili stated that the time to begin fulfilling his promises has come, and presented his government’s program: "For Strong, Democratic, and United Georgia". Ivanishvili highlight the main topics of the program, which emphasize the need to de-politicize law enforcement structures, cultural sector, education system, prosecutor’s office and the development and reinforcement of democratic institutions. The candidate also touched upon reforms in the social sector, including common insurance policy, the health care system, agriculture development and other sectors. Freedom of media and judiciary was also nominated as a priority area for the new government. According to Ivanishvili, the main goal of the new government will be to work towards the "de occupation" of the country. He explained that news ways to negotiate with Abkhazians, South Ossetians and Russians will definitely be found. He said that parts of the constitution should be changed but added that any changes will only be made following large scale discussions with public and competent people. “Such a model should be elaborated that will ensure the country’s stability. [We should have] such a constitution that will enable the opposition to have levers to exercise control over the majority. 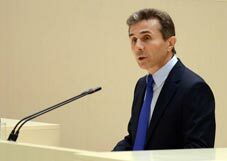 Hence, the model of balanced, effective state structures will be created,” Ivanishvili said. Structural modernization of economy will be carried out, Ivanishvili said. According to him the country's leadership will ensure the formation of a free and concurrent market environment. Agricultural manufacturing will increase and exports will grow. “It is our priority to activate a free trade regime with the US and Europe and to restore trade relations with Russia,” Ivanishvili said. The Ministry of Internal Affairs will turn into a civil service. According to Ivanishvili police will be free of political pressure and will be servicing the state and the people. Herein, security services will be separated from the MIA and a united independent state security service will be created with new content, form and structure. After Ivanishvili’s speech debates were launched between representatives of the majority and minority. According to Georgian Dream (majority) representative Vakhtang Khmaladze, there is an unbalanced political system in the country and carrying out changes in this regard is essential. Khmaladze hoped that the minority will also support the constitutional changes which will create a inter control mechanism in the country. According to Manana Kobakhidze, the election program represented by the coalition was supported by Georgians and “it is less important whether the minority supports it or not.” She also underscored that all the former ministers who ran away from the country will be responsible for all transgressions, and will be held accountable to the law. Parliament members spent the greater part of the debates accusing each other. The current majority accused the minority of committing illegal acts and not fulfilling their promises. In response, minority representatives began blaming the majority for frequent changes to the government program, discrimination of the country and unclear future intentions. “The incoming team has no real program. There are many in the Parliament for only to diminish the achievements of the UNM and just to slander us…they do not think of Georgia’s advancements towards NATO or economic welfare of the country,” Gabashvili said and appealed to the coalition to think more about where they are and what responsibilities they have for the Georgian people. According to fellow UNM member, Giorgi Baramidze, the UNM's loss in the elections does not mean the party's annihilation. “Forty percent of Georgians voted for us…the incoming cabinet of ministers has no defined program and they will be engaged with representing the past 8 years as the period when nothing was done in the country. I appeal to all to remember what was going on in the country when the National Movement came to power,” Gabashvili said. Former Parliament Speaker, Davit Bakradze emphasized that the directions which were represented in the coalition’s election program were absolutely acceptable for him. However, the government program lacks accuracy and therefore it did not deserve the minority’s approval, according to Bakradze.